This years annual garden party at Blakeley Green House is being held onSaturday 6th July between 2-4pm. We have stalls selling plants, cakes, jam, and other interesting items along with refreshments, so look forward to seeing as many people as can make it to support the charity work we do to support the Christian ethos for the tenants and staff at BGH. We as a church support the 13 tenants throughout the year with Christian ethos and financial support. The service takes the form of walking the grounds to bless the house, grounds, and animals; it’s a nice service. All are welcome to attend, we also would like to welcome new members to help us support the trust. We often hear about dementia but do we really know what it is and what it’s like to have it? It makes such a huge difference to people with dementia if those around them know what dementia is and how it might affect them. Dementia Friends aims to make everyday life better for people with dementia by changing the way the nation thinks, talks and acts. By 2015, we want there to be a million people with the know-how to help people with dementia feel understood and included in their community. You can find out more about how to become a Dementia Friend by visiting www.dementiafriends.org.uk. Alternatively, speak to Susan Fisher, who is exploring the possibility of training for Dementia Friends at St Paul’s. Thus year, Prisons Week is 18th-24th November. During the week, we are asked to pray for all who are victims of crime, administer justice, work in the prison service, prisoners and their families. Meet with the chaplain of Featherstone Prison to hear about the work of the Sycamore Trust at our Churches Together meeting on Thursday 6th December, 7:30pm at Fordhouses Baptist Church. A big thank you to all at St Paul’s who sponsored and helped to support the team that walked and climbed the three peaks challenge earlier this year, in memory of Tom Ellick. The final total from the fundraising was £3,185.50. The money will be used by the Friends of Broadmeadow School to purchase outdoor water-themed play equipment. Thank you to everyone who brought goods to the St Paul’s School or Church Harvest festivals. The tins and packets were delivered to the Wolverhampton Food Bank on Tuesday, where they will be used to provide food parcels to families in difficulty. 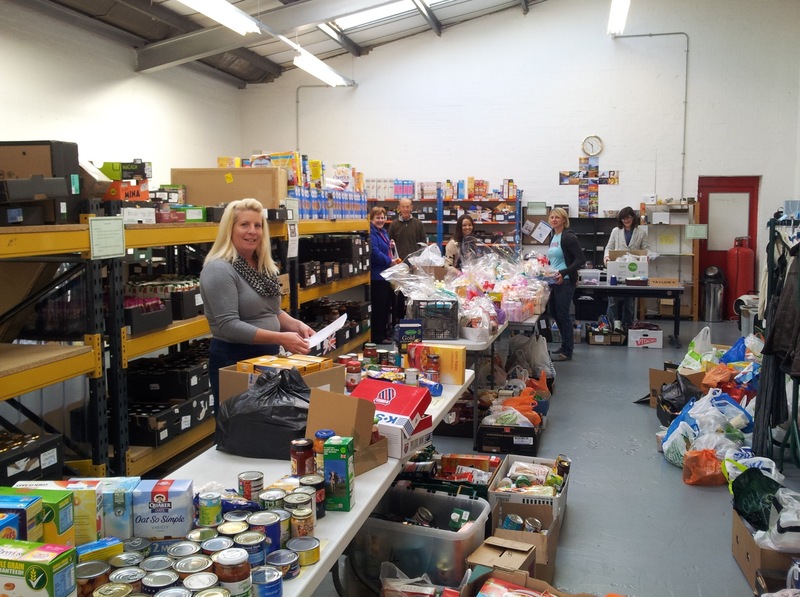 The photograph shows some of the volunteers at the food bank sorting the goods and putting together the parcels. We are continuing to collect items for the Food Bank and for the Little Brothers of the Good Shepherd, week by week. There is a box in the church lobby for tins and packets for the Food Bank, and a plastic basket for men’s toiletries and food items for the Little Brothers. There are full lists of suitable items on the ‘how we can help’ leaflet in church. The Food Bank also welcomes volunteers. If you’d like to know more, speak to Jim. Blakely Green House are doing a Garden Tidy on Monday 29th October and need volunteers to help between 10am and 2pm. Please bring your own tools if possible. As this falls during the schools’ half-term break we hope we can get lots of help. One of the things we are looking to tidy up is some old vines for which there are (we have been told) plenty of grapes that could be used for wine making !! !